Let’s face it: aside from the tired “put your hands in the air” schtick, modern DJing can be a pretty low-key affair. But a new app from Japan’s Shikumi Design could put the energy back in the booth. 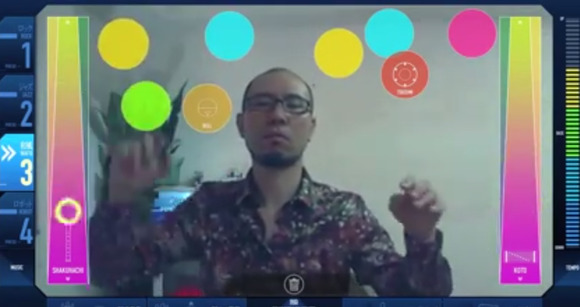 Kagura—which, like so many contest winners, appears to be a proof of concept—allows users to play a number of virtual instruments just by waving their hands. Placing a hand over a drum icon, for example, plays a beat, while a user could wiggle his or her virtual fingers to “play” a mandolin. The app appears to be fairly sophisticated, allowing users to control the tempo via gestures, for example, or record sound samples on the fly. As the demonstration video below plays, your first thought might be: how is this any different than a turntable, keyboard, or touch screen? But as the music plays on, there’s a glimpse of what this app could be: a fusion of dance and gestures, allowing the DJ to play pre-recorded samples or tracks, mix in a custom instrument or two, and do it in a way that’s visually engaging. For Intel, perceptual computing remains a way to re-invigorate the PC, still the platform that Intel has hitched its wagon to. (Rival AMD has sewn up the console market with its own chips, including the Microsoft Xbox One and its Kinect sensor.) However, Intel is facing a PC market that is declining faster than expected. Intel began showing off its perceptual computing chops earlier this year. And several PC OEMs have said that they’ll begin integrating Kinect-like depth sensors into the laptop bezel, giving apps makers like Shikumi the hardware necessary to develop upon. Intel also previously named three grand prize winners of the first phase of its contest: Matthew Pilz’s Magic Doodle Pad; Lin Yunfan’s “JOY” dynamic phrase generator, which also controls track playback via gestures; and Matthew Hoban’s “Mystic Blocks” game. We were also impressed by Unicorn Force’s game, Head of the Order, which uses “Ultima Underworld”-style glyph drawing to cast spells at enemies. For now, perceptual computing remains more of a curiosity than anything, with a few niche applications. But Intel, Microsoft, and others hope that will change. Intel will have more to show in the perceptual computing space at the Consumer Electronics Show in Las Vegas in January. Correction: A previous version of this story incorrectly stated that Intel executive Mooly Eden had left Intel.